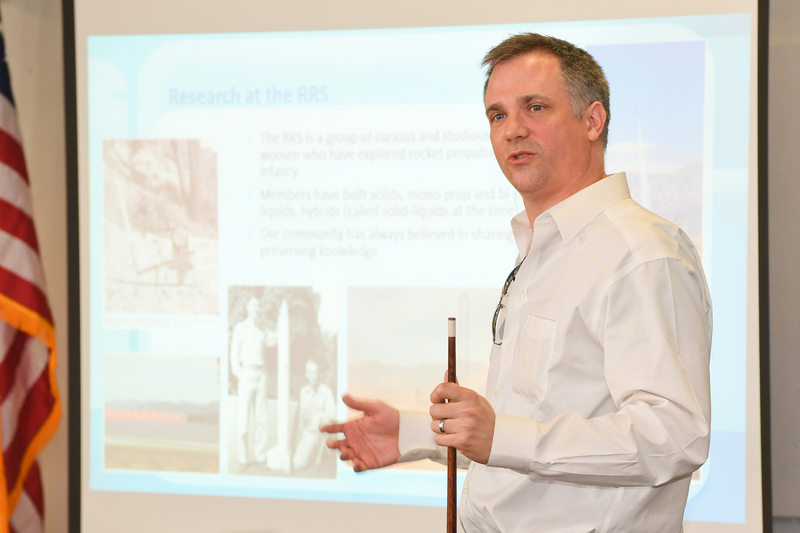 The RRS was glad to be invited to attend the 48th meeting of the Rocket Test Group (RTG) held at the Air Force Research Laboratory (AFRL) at Edwards Air Force Base, California, on April 11 and 12, 2017. I had the honor of representing the RRS at the event and would like to thank Phil Rice of AFRL and Tom Jacks of NASA Stennis Space Center (SSC) who are the current chairmen of the RTG. 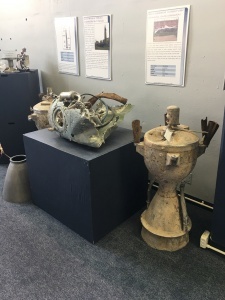 The RTG is an entirely volunteer organization of rocket test facility operators where they share experiences and safe practices in an effort to pass knowledge between private industry, government and academia. The RRS was glad to make a presentation introducing ourselves and sharing our long rich history. It was great to see the presentations and listen to some of the new developments and issues among the country’s different rocket testing organizations. 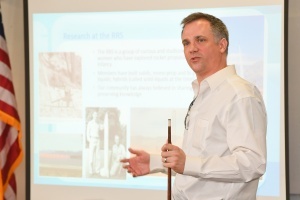 Presenters at the event included AFRL, Purdue University, Parabilis Space Technology and Aerojet Rocketdyne. Also in attendance was XCOR, Blue Origin, Aerospace Corporation, Johns Hopkins University and NASA SSC. 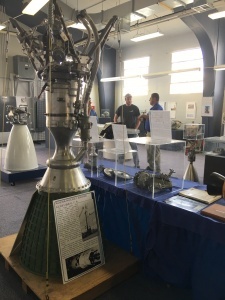 Photography was only permitted inside of the meeting hall which had some great exhibits of historic rocket engines including the Agena upper stage and a recovered SCUD engine. 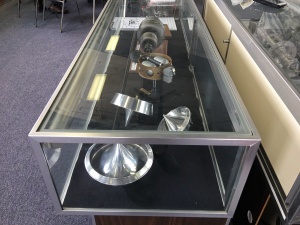 Also in a display case at the AFRL meeting hall were flight prototypes of laser light propelled disks invented by Dr. Leik Myrabo, researched by the Rennselaer Polytechnic Institute and developed by the company Lightcraft Technologies in 2001. It was a fascinating experiment showing how a powerful ground-based laser system (such as those developed under the former “Star Wars” program from the Cold War) could be used to propel a very small spinning disk payload to high altitudes and perhaps even to orbit. 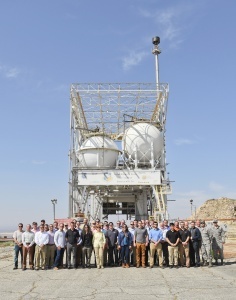 In addition to the presentations, our Air Force hosts gave us a tour of the research and testing facilities. 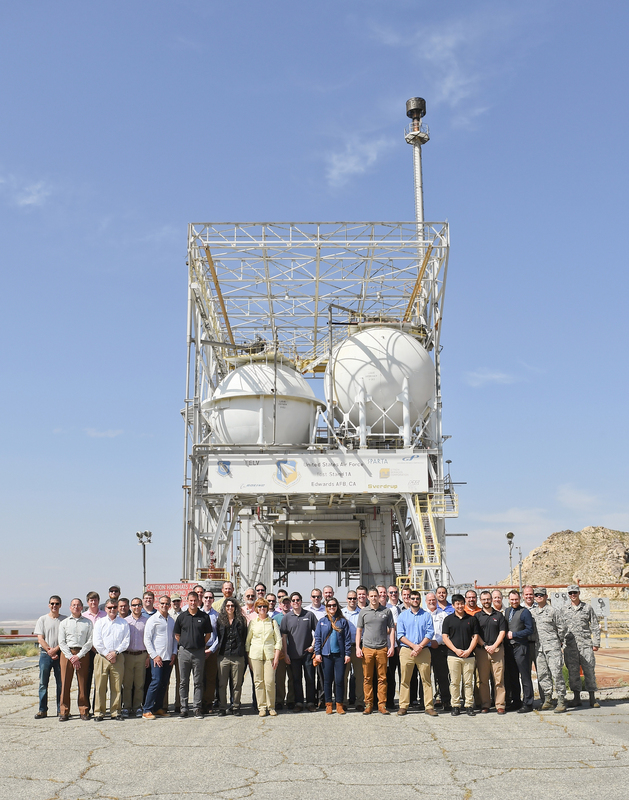 We got to witness a solid grain test firing at Area 1-32, tour the AFRL liquid rocket stands, the Space Propellants Environmental Facility (SPEF) and the AFRL Electric Propulsion laboratory. Photography wasn’t allowed on the tour, but we had a group photo taken in front of the historic AFRL 1-A stand where the F-1 engine was proven in the 1960’s and the RS-68 engine started development in the late 1990’s. It was truly a pleasure to see so much history at AFRL. The RRS was also glad to be accepted into the RTG organization as an educational non-profit group and we look forward to attending the next bi-annual RTG meeting later this year.